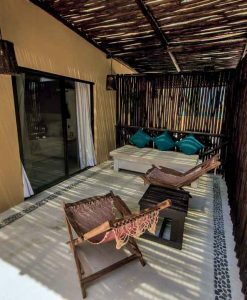 Junior Suite with traditional ‘palapa’ roof and garden view · 1 Extra King Bed, Private bathroom with Jacuzzi experience + shower, Ceiling fan, Wireless Internet in common areas, Safe, Air Conditioned, Hair dryer and SKY TV. To confirm your reservation it is necessary to send the advance payment of the entire stay. our payment must be done within 24 hours, after which the reservation will be automatically canceled.